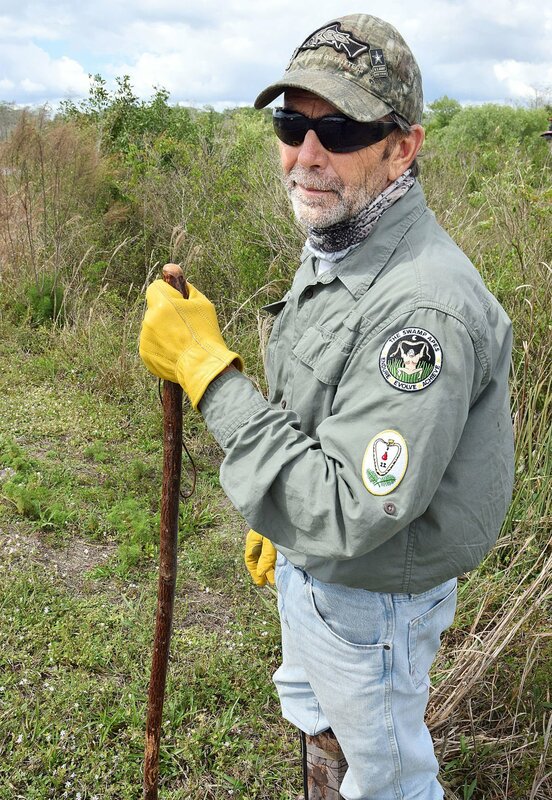 Jeff Butler dressed for a day of python hunting in the Everglades of south Florida. Leather gloves help handle non-poisonous pythons, but leg gaiters are necessary to protect hunters from bites of other venomous snakes living in the same environment. Above: Pythons are one of the largest snakes on the planet and grow to maturity in three to four years. This hefty snake was caught by Swamp Apes. A new wild capture record for south Florida was established in November when another hunter brought in a 120-pound female that measured 17.5 feet long. Top: Wisconsinite Jeff Butler, front, and another Swamp Ape were part of a small group that paddled into a nesting area near Big Cypress National Park in south Florida early in March. Although they didn’t track down any pythons that day, Butler said he is eager to go back next winter because of the camaraderie with other military veterans. Floridian Tom Rahill founded Swamp Apes in 2008 and works with military veterans on a volunteer basis nights and weekends. His day job is as a telecom administrator, but he also does contract removal work, targeting pythons and pests like this non-native green iguana. Swamp Apes founder Tom Rahill said he is very protective of the Swamp Apes image, saying it is less about capturing pythons than it is about the slogan — endure, evolve, achieve — and giving veterans an opportunity to focus on something beyond the traumas of their military experiences. EVERGLADES CITY, Fla. — Jeff Butler was on site and only days away from joining a special team of python hunters for a New Year’s Day 2017 trip into the Everglades of south Florida when he got word from back home in Frederic, Wis., that a best friend had died suddenly. It was devastating news for Butler, who was now more than 1,500 miles away, just starting a new seasonal job with the U.S. National Park Service in Florida and about to search out Burmese pythons with the team called the Swamp Apes. Swamp Apes is the creation of Floridian Tom Rahill. In 2008, his wife got a tenure-track college position out of state, and as a way to cope with her absence, Rahill volunteered four days a week in the Everglades National Park clearing trails and capturing pythons. “It helped me take my mind off the grief of missing my wife so badly, and at the same time I had relatives serving (in the military), so I had a support focus on the military,” Rahill said. He credits divine intervention for thinking of putting the two elements together and forming Swamp Apes as a nonprofit organization to offer his rather unusual coping option to veterans dealing with post-traumatic stress disorder and other emotional challenges of transitioning out of military service. Since 2009, Rahill has taken more than 100 veterans and several hundred members of the public and media into the Everglades and Big Cypress swamps of south Florida to capture pythons. He said the time spent focusing on the mission can be therapeutic and that some of the participants have told him they don’t have their old nightmares anymore. Still, there is an enemy, and it is the Burmese python. The snakes are native to south and southeast Asia but were first found in the Everglades in the 1970s where their size and ability to reproduce quickly without any natural predators has turned them into a serious environmental concern. It is believed that tens of thousands of the invasive snakes are dispersed across more than a thousand square miles of south Florida, including all of the Everglades National Park and parts of Big Cypress National Preserve just to the north. According to the U.S. Geological Survey, from 1997 to 2012 the raccoon population in the southernmost part of the Everglades where pythons are most plentiful dropped 99.3 percent, opossums dropped 98.9 percent, and bobcats 87.5 percent. Marsh rabbits, cottontail rabbits and foxes are generally gone from the wild, and all of those animal species have been found in the guts of necropsied pythons, along with deer, alligators and a wide range of birds. Rahill said he guards the Swamp Ape image carefully, because it’s easy for outsiders to get caught up in the story of the snake itself. Unlike some citizen snake hunters who shoot the pythons to bring them in, Swamp Apes has a policy of live capture. Snakes are turned over to the USGS where they are either tagged for telemetry studies or euthanized for gut analysis. That is what Jeff Butler, a Vietnam War veteran, found when he spent his first day with the Swamp Apes two years ago. He said his mind was on death and his friend, Charlie, as he looked out across the sawgrass, but it was refocused two hours into the trip when he was put to the task of capturing an 8-foot python, which he later named in honor of his late friend. The Everglades experience has other connections for Butler, who runs a number of federally supported wilderness outings for veterans on the Namekagon River within the St. Croix River National Scenic Riverway of northern Wisconsin. His father introduced him to the river on a hunting trip just after he got out of the Army in 1974. After “bumming around” and working in other states, Butler returned to the Namekagon and St. Croix rivers, first guiding wilderness trips for troubled youth, later doing veterans programs for Outward Bound of Minnesota and running a veterans program for the St. Croix Band of Chippewa, and then returning to youth programming on the river. In about 2012, Butler was contacted by the U.S. Park Service and asked for ideas to draw more families to the St. Croix Riverway. Butler became an interpretive ranger for the Park Service, leading fishing and paddling trips on the Namekagon River for men and women veterans. In 2014, his Vets on the River was one of about five programs nationally offered to vets by the Department of Interior. Another was Swamp Apes, and Butler was intrigued. He took trips to paddle and fish the Everglades with a friend over the next two years and then applied for a seasonal job in the Everglades where he was finally able to connect with Rahill for his first Swamp Apes experience. The past two years, Butler has taken his winter break with the Park Service in Wisconsin to work with the Park Service in the Everglades. It gives him a chance to tell visitors about both experiences and how maintaining clean water and controlling invasives in the north is connected to clean water and invasives in the south. Butler said he is not a fan of snakes, but he took a second trip with the Swamp Apes earlier this month and took a veteran friend with him. They didn’t catch a python but had the experience of a common mission, camaraderie with fellow veterans and a chance to refocus their thoughts. He is back in Wisconsin and making plans to take more Wisconsin and Minnesota veterans to Florida next winter for a Swamp Apes experience. As for Rahill, a research paper on the efficacy of the Swamp Apes program for veterans is due to be published, which he hopes will prompt federal funding of the program. Up until now, he has footed the bill for roughly $20,000 a year in expenses. More information about Swamp Apes can be found at www.swampapes.org or by contacting Rahill at swampapes@gmail.com. Programs for veterans on the St. Croix Scenic River Waterway are being updated for 2019 and will be found at www.nps.gov/sacn/planyourvisit/vets-on-the-river-programs.htm or by contacting Butler at Jeffrey_p_butler@nps.gov.